Since 1991 DAS Environmental Experts has developed and produced client-specific point-of-use facilities for waste gas treatment in the global high-tech industries. 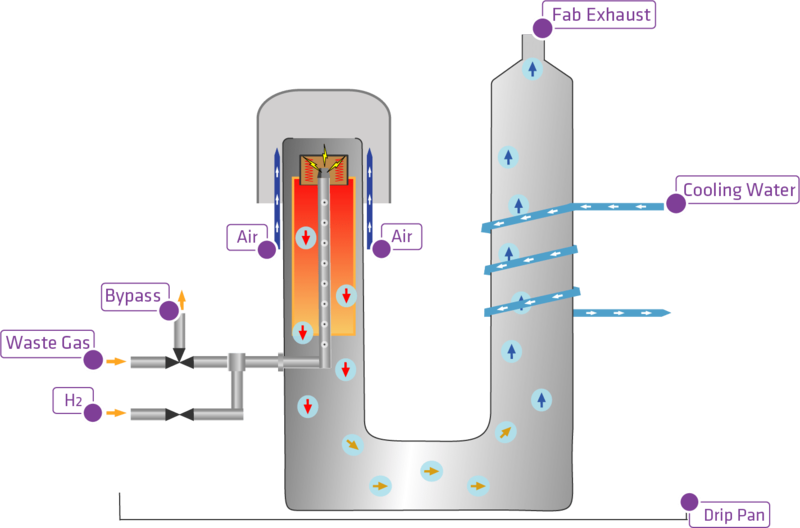 In principle, DAS scrubbers treat condensable, flammable, corrosive, reactive, toxic and/or pyrophoric gases (e. g. silanes, silane organics, terpineol, hydrogen, ammonia or hydrogen halides) and fine dust. Our clients in the semiconductor/MEMS, photovoltaic, flat panel and LED industries profit from our extensive technical expertise of our team in Dresden and worldwide. Our detailed knowledge of the manufacturing processes of our customers means that we know that waste gas is essential for the safety of the manufacturing processes. We use this expertise to offer custom fit and effective solutions for our customers. We develop and produce point-of-use scrubbers for waste gas flows up to 5,000 m³/h for a wide variety of industries. If required, we also offer integrated waste gas treatment concepts including vacuum pumps of your choice in our system or other components such as dry bed solutions. We also provide smart combinations of our different technologies to a complete system to perfectly fit your process requirements. Our product portfolio for point-of-use waste gas treatment includes four technology groups. 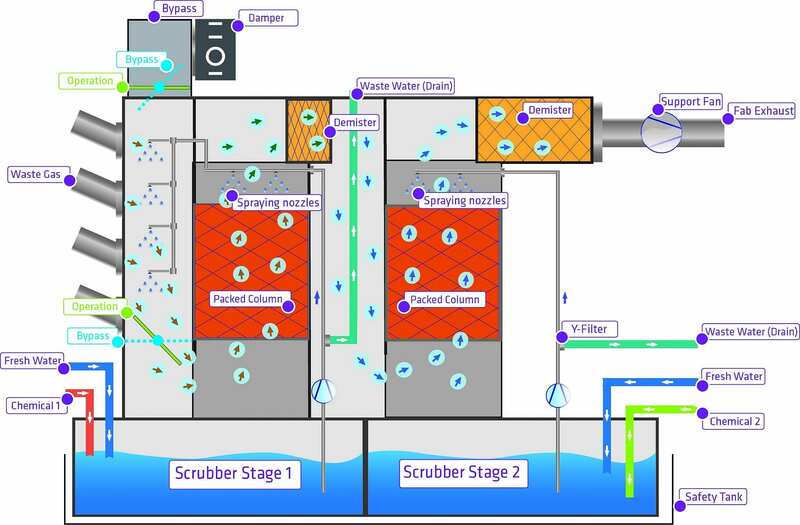 The combination of the two operating procedures burning & scrubbing in the smallest possible space is basing on our ESCAPE technology which has been continuously developed further since the foundation of DAS. Waste gases are fed into a ring-shaped burner apparatus. 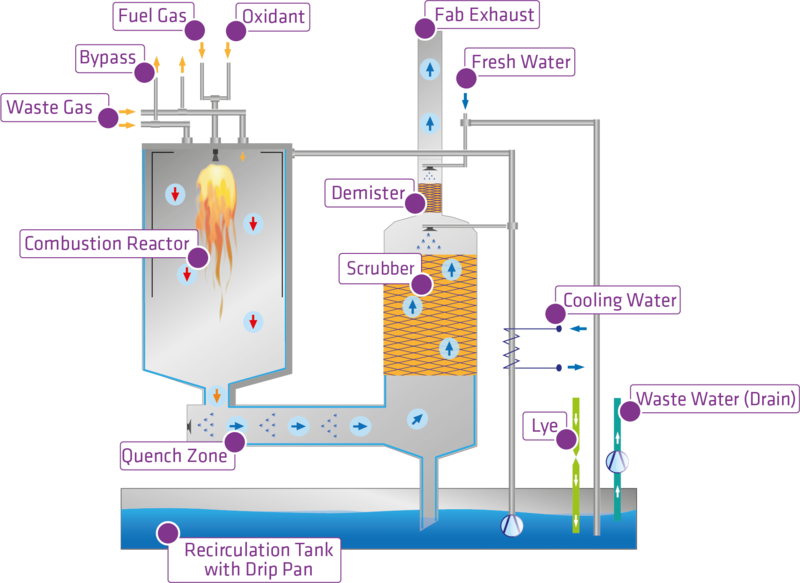 Depending on the chemical composition of the waste gases, various reactions take place (oxidation, reduction, pyrolysis). In the subsequent scrubbing process, soluble, gaseous and solid compounds generated by combustion are absorbed and cooled down by a suitable scrubbing liquid. The process waste gases are burnt in a decomposition zone. If required, a fuel gas can be applied. Depending on the chemical composition of the waste gases, various reactions take place, such as oxidation, reduction or pyrolysis. The Burner Product Family LARCH was especially designed for MOCVD processes in the LED industry. It is capable of treating large flows of the typical gases’ hydrogen and ammonia. 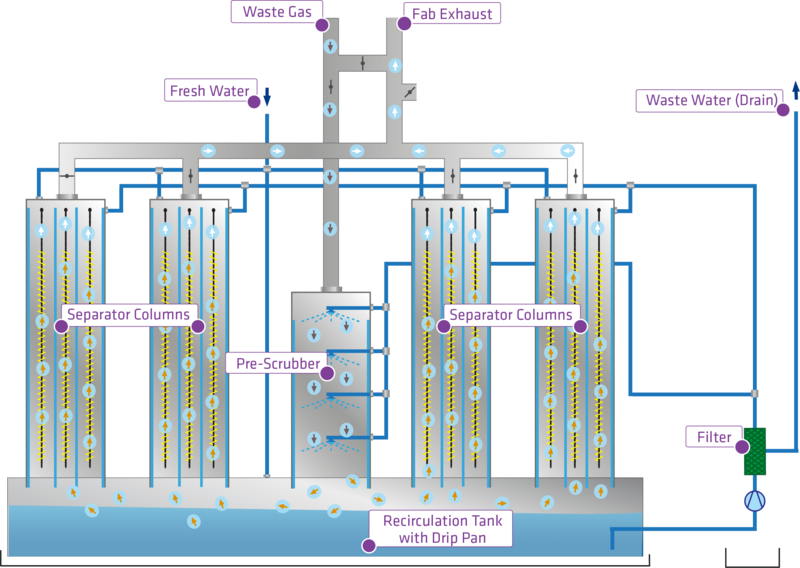 Wet scrubbing is an efficient process for the treatment of water-soluble pollutants in process exhaust gases. Our wet scrubbers are employed mainly in the semiconductor industry, as a Point-of-Use (POU) wet treatment system. Installed closely behind the vacuum pumps, they optimally protect the fab’s exhaust gas system from contamination and corrosion. Maintenance is quick and easy. Electrostatic filters use an electric field to clean process waste gases from particles. Our systems filter micro and nanoparticle-containing or aerosol-containing process waste gases as they occur e.g. in the TFT industry. For the treatment of condensable organic compounds, we offer an electrostatic condensate separator. The selection of the appropriate technology is carried out by our application specialists after analyzing the situation on site. Information about the process tool, vacuum pump, gas types and flows as well as the available operating materials are decisive. In order to ensure a long-term runtime and tool availability, our service and technical support are available on demand or on-site as soon as the system is commissioned.